Hiking seems appropriate in Bonanza Flat, but what about hunting? 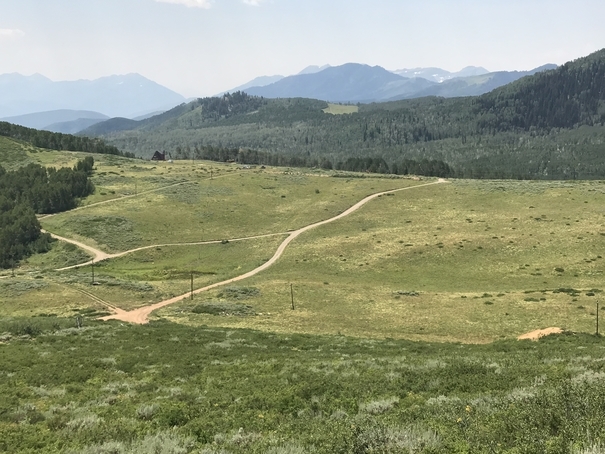 Park City and Utah Open Lands are gathering opinions about the potential future uses of Bonanza Flat, a large swath of open space recently acquired by City Hall downhill from Guardsman Pass, shown on Thursday. An online survey will be available through Aug. 30. City Hall and Utah Open Lands have designed a survey centered on the future of Bonanza Flat as officials continue to study the land and prepare to craft policies that will regulate the high-altitude acreage acquired by the municipal government earlier in the year. The survey results will be used as officials discuss the approximately 1,350 acres in coming months. The questions are especially designed to learn about the usage of Bonanza Flat, one of the critical topics leaders will address. Park City acquired the land in a conservation deal, meaning Bonanza Flat will remain undeveloped, but the usage must be addressed. City Hall will eventually draft a document known as a conservation easement that will govern the land. The uses are expected to be addressed in some fashion as the conservation easement is readied. Park City leaders earlier selected Utah Open Lands to hold and enforce the conservation easement. The 10-question survey, which is not scientific, asks the critical questions of what sorts of activities someone sees as being appropriate in Bonanza Flat and what sorts of activities they see as inappropriate. The options listed as answers are the same for both of the questions. They include hiking or trail running, mountain biking, cross-country skiing and snowshoeing, which are activities that have for years regularly drawn people to Bonanza Flat. Other options include camping, riding horses, hunting, driving unspecified sorts of motorized vehicles and holding group events. Some of the other survey questions seek to learn how often someone uses Bonanza Flat, from where they access the land and, if they drive, where they park. The results of the parking question could become intriguing as Park City eventually addresses Bonanza Flat access. It seems likely that many people headed to Bonanza Flat drive, but there are not improved parking areas there. Any discussions about parking improvements could be sensitive since the land was acquired in a conservation deal. One question, meanwhile, inquires whether someone is aware of City Hall’s acquisition of Bonanza Flat and the municipal government’s intention to protect the land with a conservation easement. City Hall also wants to learn the ZIP code of the people who answer the survey to better understand the makeup of Bonanza Flat users. Deters said City Hall this summer is also counting the number of people using trails in the vicinity of Bloods Lake in Bonanza Flat and intends to conduct other research like tallying cars in Bonanza Flat parking areas. “I think what we’re going to see is a lot of use, a lot of interest,” Deters said. Deters, who is well connected in trails circles, predicted hiking and trail running could be the most popular answer to the question about what sorts of activities are appropriate. He noted many people already hike in Bonanza Flat. Deters said riding motorized vehicles could be a popular answer to the question regarding the sorts of activities that are inappropriate. The drafting of the conservation easement became one of the crucial tasks for City Hall immediately after the acquisition was finalized in June. Officials this summer have allowed Bonanza Flat to be used in the same fashion as it has historically, but the conservation easement will regulate the land once it is finalized. The municipal government has crafted easements for other parcels City Hall has acquired for conservation purposes, but Bonanza Flat is seen as being a more complicated piece of ground based on factors like its size, elevation, location toward the top of a watershed and role as wildlife habitat. There has not been broad resistance to the details of other easements. Deters said he anticipates the conservation easement will be completed as early as January. He said additional surveys with more detailed questions are planned. He said City Hall intends to hold open houses as well. The results of the current survey will likely be made public in September. Bonanza Flat was the grandest of City Hall’s conservation acquisitions and was desired for decades Park City voters passed a $25 million ballot measure and a fundraising effort involving private individuals, government bodies and not-for-profit organizations closed the $13 million gap between the voter authorization and the $38 million acquisition price. The seller, Redus, LLC, is tied to Wells Fargo and Midtown Acquisitions, L.P., which took control of Bonanza Flat in a foreclosure case against the Talisker corporate family. United Park City Mines held the land for decades before it came under the umbrella of Talisker. The survey is available on the City Hall website, http://www.parkcity.org. Select “Bonanza Flat Resource Survey” in the ‘Latest News’ section of the front page. The direct link is: https://www.surveymonkey.com/r/M7LGJGG. The survey runs through Aug. 30.